Silberman Building, Rm 120 2180 Third Ave. at 119th St. 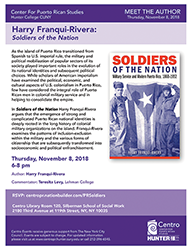 In Soldiers of the Nation, Harry Franqui-Rivera argues that the emergence of strong and complicated Puerto Rican national identities is deeply rooted in the long history of colonial military organizations on the island. Franqui-Rivera examines the patterns of inclusion-exclusion within the military and the various forms of citizenship that are subsequently transformed into socioeconomic and political enfranchisement.